Denise qualified as a nurse in 1992 and since then her nursing experience has been within general medicine and IVF specialities. She has been the lead nurse at the Hull IVF Unit since 2002 and during that time she has promoted nurse training within the Unit to ensure that our nurses have extended and enhanced their skills to deliver excellent nursing care. She has been promoting embryo transfer procedures since 2002 and ovum retrieval since 2004. She is a recognised trainer for the British Fertility Society (BFS) Pelvic Ultrasound and Embryo Transfer Course. 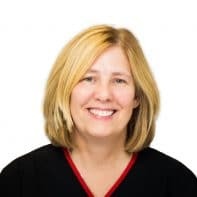 As a Nurse Practitioner Denise is able to assess all fertility patients both on the IVF Unit and within the Subfertility Clinic and prescribe the medication required for their care. Denise is trained to perform HyCoSy investigations, a tubal patency test performed under ultrasound. She has a special interest in ultrasound and has undertaken a Masters Diploma in Advanced Practice focusing on pelvic ultrasound in IVF. Denise has an MSc in Advanced Practice specialising in Ultrasound. She is also a member of the Senior Infertility Nurses Group (SING). Denise has been involved in many research projects within the IVF Unit over the years, most of which have enhanced and updated our practice.